Hydranoid is one of the strongest species with a body composed of a highly intelligent, independent cell structure. It is completely controlled by Masquerade and obeys all of Masquerade's commands. This dragon like Bakugan has very strong armor, a revolting face, spines all over its body, and a sharp flail for a tail. Its mobility is slow, but can battle all species with its extremely powerful and forceful strikes. Hydranoid is a mercilessly cruel and unforgiving monster, not to mention extremely violent and arrogant that feeds off the power of Bakugan sent to the Doom Dimension. Like his nemesis Drago, Hydranoid can evolve into a more powerful monster. Dual-Headed Hydranoid as it's name implied has two heads, making it even more powerful. 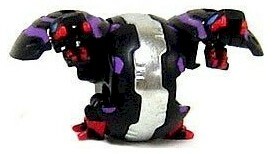 Purchase Dual-Headed Hydranoid from Amazon now!